Silky rock jasmine is a charming little plant. This Himalayan native produces adorable umbels of bright pink to purplish flowers atop 2-4 inch stems which bloom between June and August. The stems rise out of tight, ground-hugging rosettes that send out runners forming new rosettes akin to a strawberry plant, but only spreading to 12 inches wide. The fragrant flowers have 5-6 small petals with a yellow center. 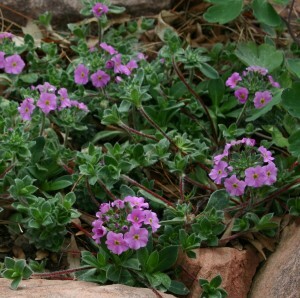 Their stems have a reddish tinge to them and just like the rosette, are covered with tiny white hairs, which is somewhat typical of alpine plants. The grey-green foliage of the rosette is very downy. From a distance the rosettes look like small hens and chicks all snuggled together but they are very soft to the touch. A member of the primrose family, silky rock jasmine is right at home tucked in a rock garden, trough, crevice garden or even a fairy garden. Technically an herbaceous perennial, it has stayed evergreen through some of the harshest winters in our Colorado prairie gardens. Hardy to 13,000 feet, silky rock jasmine will do well in sun or part shade. It needs regular water to become established, but once it is, it will thrive in moderate to slightly dry conditions. We have found that specimens planted in part shade can take slightly drier conditions. It’s happiest in unimproved, well drained sandy or loamy soils, surrounded by a small rock or gravel mulch. You’ll want to have this tough little perennial in your rock or fairy garden. Thanks to Ginger Jennings & Lina Fletcher, Tagawa Gardens, for this piece.